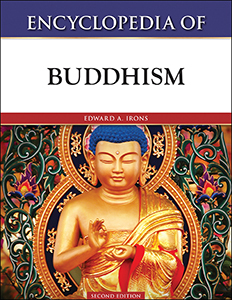 Encyclopedia of Buddhism, Second Edition provides easy access to the terms, concepts, personalities, historical events, institutions, and movements that helped shape the history of Buddhism and the way it is practiced today. Although the primary focus of the encyclopedia is clearly on Buddhism in all its forms, it also provides introductions to Daoism, Shinto, Confucianism, and other religious practices in East and Southeast Asia. A comprehensive introduction that provides an overview of the tradition, a chronology, cross-references, further readings, a bibliography, and photographs complete this volume. This easy-to-use and essential encyclopedia is ideal for high school and college students, researchers, and general readers. Edward A. Irons is a consultant and director of the Institute for Culture, Commerce, and Religion—a research center considering cultural issues in China, particularly Hong Kong. He holds a Ph.D. from the Graduate Theological Union in Berkeley, California.